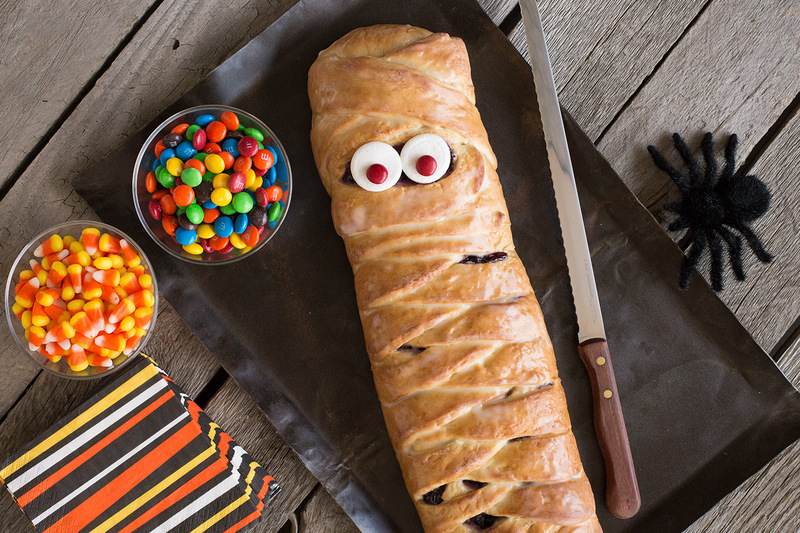 A sweet treat to share at your Halloween parties. Spray counter lightly with cooking spray. Roll loaf or combined rolls into a 15 x 15 inch square. Cover with plastic wrap and let rest 10-15 minutes. Combine cream cheese and sugar until smooth. Remove wrap from dough and spread cream cheese mixture in a 5 inch strip down center of dough. Top with blueberry pie filling and nuts. Make cuts 1 inch apart on sides of dough to within 1/2 inch of filling. Begin braid by folding top and bottom strips toward filling. Then braid strips left over right, right over left. Finish by pulling last strip over and tucking under braid. Lift braid with both hands and place on a large sprayed baking sheet. Bake at 350 degrees F 25-30 minutes or until golden brown. Combine icing ingredients and mix well. Cool slightly and brush with icing. Place a slice from a marshmallow and candy near the top of braid for eyes.